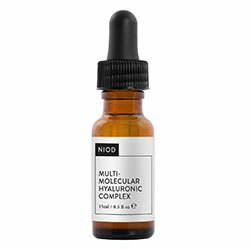 NIOD Multi-Molecular Hyaluronic Complex (MMHC2) Review 2018: Ingredients, Side Effects, Detailed Review And More. The NIOD Multi-Molecular Hyaluronic Complex (MMHC2) is the second generation of its kind. It is made to boost your skin’s hyper hydration. It dramatically improves your skin’s hydration level by using a water-based complex. It significantly improves your skin’s elasticity and surface texture. It promotes enhanced skin protection with the addition of antioxidants. This product promotes instant as well as longer-term improvement to your skin’s health and overall appearance. It helps your skin better absorb the beneficial ingredients that can be derived from other products in your regimen. NIOD Skincare – Does it Really Work? This product works by delivering 15 kinds of hyaluronic acid, present in this formula at different molecular weights, to hydrate your skin at different levels. The combination of antioxidants and peptides further boost the healing and skin enhancing effect of this product’s formula. Myristoyl Nonapeptide-3: This ingredient performs in the same way that retinol does — it speeds up skin regeneration and turnover — without posing the same side effects as retinol does. Arginine and Histidine: Amino acids that promote skin elasticity while also applying anti-inflammatory functions to relieve your skin of irritation. Alanine and Serine: Amino acids used for skin conditioning. Glycine, Valine, Isoleucine, Proline, Threonine, and Phenylalanine: Amino acids that increase the volume of skin precursors, it also strengthens your skin. After cleansing, apply MMHC2. Add a generous amount and spread evenly. The manufacturer recommends using this product with the NIOD Copper Amino Isolate Serum (CAIS). In which case, apply CAIS first then, MMHC2 next. The addition of 15 forms of hyaluronic acid restores your skin’s hydration at multiple levels which not very many similar products are able to accomplish. It improves your skin’s water barrier. It enhances skin absorption of other products in your regimen. Its hydration function may not suffice for drier skin types. This product is alcohol-free, nut-free and oil-free. There are no silicones in this product that can block your pores. The formula suits the vegan lifestyle. This product has never been tested on animals. Does NIOD Skincare Have Any Side-Effects? The manufacturer does not mention any potential side effect. In case you experience any sign of irritation, immediately discontinue product use. The NIOD MMHC2 has the potential of being the next big addition to your skincare regimen, that is, depending on your skin’s peculiarities and required care. In any case, it will be best to compare this product with other serums so you can have a better sense of what you will benefit from and what else you might miss. Read the labels and research so you can choose wisely. What is the Price of NIOD Skincare? NIOD MMHC2 costs $40 for a 15 ml bottle. Where to buy NIOD Skincare? This product may be purchased from the official brand website and from other online retailing sites. It is also available in physical stores in select countries only. Does the NIOD Skincare come with money back guarantee? No, there is no mention of such coverage anywhere. Is NIOD Skincare approved by the FDA? There is no need for products like this to be reviewed and approved by the FDA. Who Should Use NIOD Skincare? NIOD MMHC2 is for all adult skin at any age. Should I use the NIOD Skincare once or twice daily? This product is recommended for twice daily application. How long does one bottle of NIOD Skincare last? One 30 ml bottle should last you well for 30 days although it can vary based on your application technique and frequency of use. How long will results last? Improvements derived from regular and consistent product application lasts only for as long as you keep using this product. Skin impact fades when product use is discontinued. Can I use the NIOD Skincare with makeup? Yes, it will be a great serum to wear under makeup because of its sheer and oil-free formulation.